This battle fought on the same day as Waterloo, June 18th 1815, sealed the fate of Napoleon and the First Empire. After beating the the Prussians at Ligny, Napoleon ordered Grouchy, the last man Napoleon would make as a marshal of France, to take the III and IV corps along with the 21st infantry and 4th cavalry division and make sure the Prussians could not interfere with Napoleon's battle against the English. Hearing the sounds of battle from Waterloo, Grouchy refused his subordinates' requests to 'march to the sound of the guns'. The Prussian III corps under Thielmann had only 17,000 men, but he kept Grouchy's 33,000 men occupied for the day. By not trying to attack the rear of the Prussians marching to Waterloo, Grouchy allowed those Prussians to tip the scales in the battle of Waterloo against Napoleon. Historians have had a field day from that day on as to whether Grouchy should have followed his orders or used his own initiative. I think this quote sums up the correct answer "After the battle the King can do what he likes with my head, but during the battle will he please allow me to use it"? (Friedrich Wilhelm Von Seydlitz answer to orders from Frederick The Great during the battle of Zorndorf). 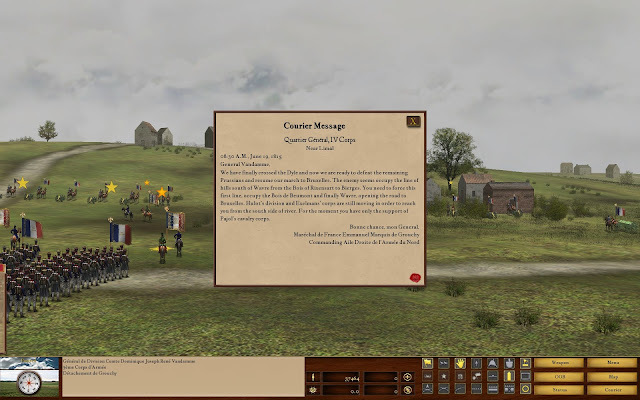 This new DLC finishes up the four battle set of Napoleon's campaign in Belgium in 1815. 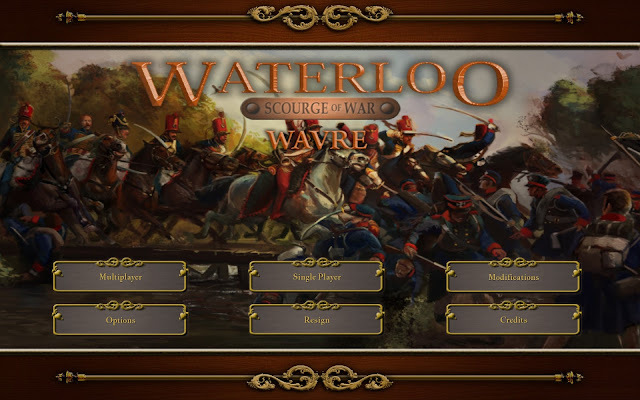 The main game is 'The Scourge of War Waterloo', and the other two DLCs are Ligny and Quatre Bras. At this time there is no linked campaign between the main game and the DLCs. You fight each battle and its scenarios separately. Both 'Scourge of War Gettysburg' and 'Scourge of War Waterloo' have a large and very active modding community. So I am sure that is being worked on at the moment. One point in particular needs to be addressed right at the beginning. 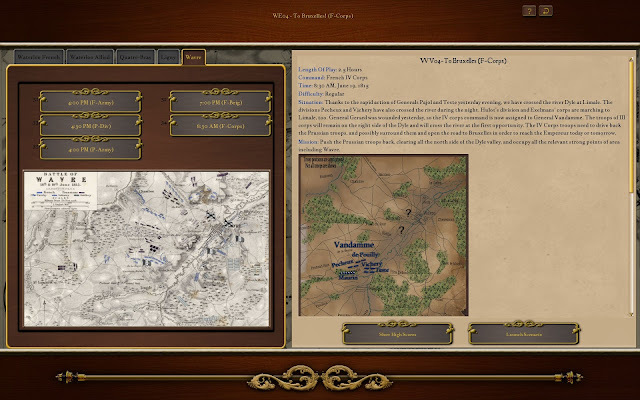 This is a command simulation, and sometimes the 3D representation in the game does not match the actual situation that is being portrayed on the map. Some people are nonplussed at the fact that they cannot seem to move and position their troops 'just so' on the battlefield. At times, there are also some strange movements of both sides of troops during a firefight or charge. These do not reflect the actual 'under the hood' calculations of the actual combat taking place. Once a budding computer general understands this point, the game becomes much more understandable and enjoyable. The game can be played in several different ways. You can play from a 'Gods point of view' meaning that you can travel with your mouse over the entire battlefield to see everything that is going on. The other way to play is in 'HITS' mode. This acronym stands for 'headquarters in the saddle' (do not get confused with John Pope here). What this means is that you can only see exactly what your computer general can see at any moment of time on the battlefield. While using this mode and the courier system that the game has, it is a very good representation of 19th century battle. While you might be driving the enemy before you from where you are positioned at the moment, both your flanks could be crushed and your troops fleeing on other parts of the battlefield. The AI in the game has always been one of the franchise's best selling points. It is tough, not only as an opponent, but also as an ally or subordinate. The other great thing about the games is the visual representation. I am an old hex gamer, so to be able to see the sweep and sheer size of a Napoleonic battlefield in action is pretty amazing. 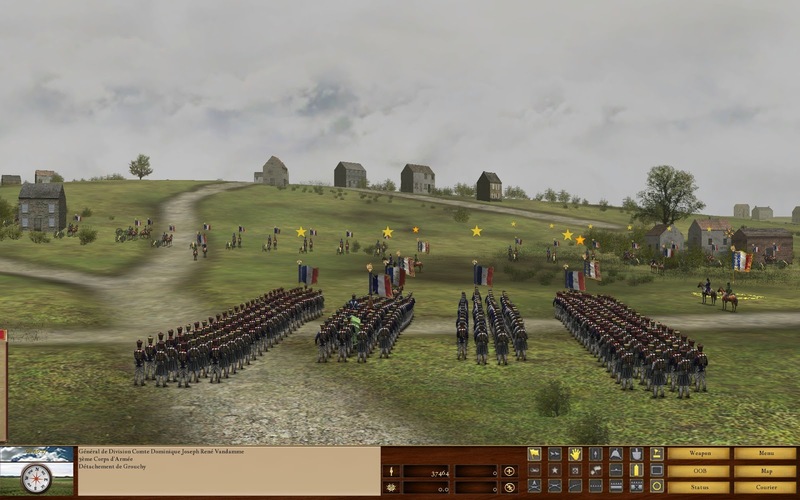 NorbSoftDev has always made it a point to be as historically accurate with the actual battlefields and the OOBs, along with the actual troops' uniforms. Victory conditions are based on geographical points captured or defended and also the casualties suffered by both sides. I want to reiterate that there is a brilliant group of modders that work on these games, and they have made a ton of scenarios for other battles and eras. Naturally, the mods cannot be as well done as NorbSoftDev's official DLCs, but some come very close. There is also a very large group of active people who play multiplayer with all of the games of the series.